Midway through the week, we had the privilege of taking non-perishable food items to some of the poorest of the poor in Monjas. It was heart breaking seeing the state in which some of these people lived, yet we saw God in the midst of our evening. We first visited a mother and her seven children, one of which was bed-ridden with what they believed to be a serious mosquito-born virus called Chikungunya. Who knows if he will be alive a year from now apart from God’s intervention. 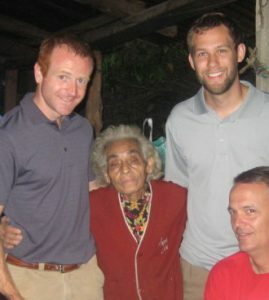 We were told that this mother was usually drunk in the streets, but it so happened that the Lord had her present in her home the night we arrived, which gave us the ability to pray for her. I prayed that she would have peace, and that she would see Jesus as everything she needs…that she would see Him as a footwashing kind of God. Then we laid our hands on the sick little boy and prayed for him. The second home we visited was an elderly lady (75+ years old) with hair that looked like a birds nest. She was eccentric to say the least…full of joy though. She greeted our group with big kisses on the cheek. This lady had very little materially to be joyful about. Her adobe house had caved in a long time ago, so she was sleeping at her sisters’ house every night. But all of her belongings were under a tarp in this modest corner of the surrounding shacks. She joked about her skinniness, undoubtedly due to a lack of food. The third home was another elderly lady who had just finished her dinner consisting of half of a tortilla and a bit of coffee. She lived alone with her 52 year old epileptic nephew. Her sons and husband had all died within the last two years. I was so moved by her loss that I stayed behind for a personal prayer for her heart after everyone else had left. Finally, we drove to the home of four…a mother, father, and two children…who lived on a dirt floor in the corner of someone else’s property, with sheet metal over their head and a small dinner cooking by pan. By the dim light of their only lamp, we could see the sad faces of their children who were probably extremely confused, wondering why six gringos and a couple translators suddenly appeared in their home. You could tell the father was embarrassed that his family was living in that condition. Nothing hurts a man more than feeling like he can’t provide for his own. But we prayed that they would have the strength and joy of the Lord, as well as new opportunities. I’m sure the Lord has provided those things. All of this pain and suffering had me troubled…and I spent the next several days processing this evening. I have seen poverty all my life. Starting with the garbage dumps outside of Mexico City when I was 12. I minister every week with poor families in the inner city of KC. But this was a fresh, stark reminder of the state of our world. As I wrestled with these experiences, I could sense my sin nature kicking in… I noticed that I would tend to blame God for this plight, rather than seeing poverty as the result of sin, like corruption, greed, and pride. But as I prayed about it, I was reminded that God is not like us. He allows suffering for his good purposes. Like Andrew so eloquently stated the night before our departure back to the states – the only way to reconcile a good God with the suffering that we have experienced is to acknowledge that this life on this earth is not really about life on this earth. There is such a bigger reality going on. Bigger things than the conditions these people find themselves in. Whether one lives in the rich suburbs of the USA or the poorest areas of Guatemala, what truly matters is if they are “rich toward God” (Luke 12:21). The affliction of God’s people turns out for their glory, and it prevents them from going down a road of sin to the pit. Because those [righteous people] who suffer in the body have ceased from sin. (1 Peter 4:1) What a powerful truth that can help us cope with the harsh reality of a broken world!